"It may sound like a shocker, but these two flavors meld together to make a sweet, yet subtle, frozen version of the well-known treat!" Heat heavy cream, 1 cup half-and-half, and milk in a saucepan over medium heat until it begins to simmer, about 10 minutes; stir in Thai tea mix and bring to a boil. Reduce heat to low; simmer 5 minutes, or up to 10 minutes for more tea flavor. Whisk about 1/4 cup cream mixture, a teaspoon at a time, into beaten egg; whisk beaten egg mixture into cream mixture in saucepan and cook until slightly thickened, about 1 minute. Strain cream mixture through a cheesecloth-lined sieve; discard tea leaves. Beat remaining 1 cup half-and-half, sweetened condensed milk, and vanilla extract into cream mixture until well blended; cover and chill for at least 6 hours or overnight. Freeze cream mixture in ice cream maker according to manufacturer's instructions. When ice cream is semi-solid, churn in 3/4 of the crushed chocolate sandwich cookies; continue to churn until ice cream is desired consistency, then fold in remaining cookies. 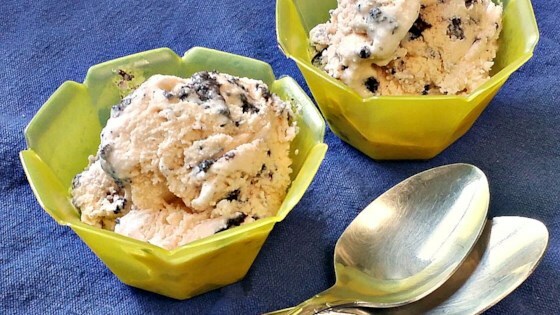 Serve immediately or freeze for several hours for a harder ice cream. See how to make green tea mochi-wrapped vanilla ice cream. Wouldn't have thought the 2 flavors but it works and its just so tasty! Will make this again, bit hit with the family!